You are currently browsing the Suburban Homesteading – Frugal Living blog archives for September, 2015. Keep a dish pan of soapy water in the sink to rinse and soak dishes from throughout the day. This will make kitchen cleanup easier, while saving water. Chickens are almost synonymous with homesteading. For most people they are an integral part of food production because they supply eggs, chicks, fertilizer, rototilling and eventually meat. Now, some may be horrified at the thought of using one of their beloved “girls” or “boys” for food, but life on a farm runs in cycles, for good or bad. Animals, like crops, have a period of productivity and then they phase into not being very productive at all. When food production is the primary focus of the farm, like mine is, nothing goes to waste. I can’t afford to let non-laying hens or old roosters stick around gobbling down expensive grains when they can be put to another use—in the house. And I don’t agree with the new trend of letting farm animals live out a life of idleness in a shelter or sanctuary. Farm animals are not “pets” they are partners in our quest to be more self-reliant and produce as much of our own food as possible—that is their purpose. That sounds harsh, I know. I don’t take pleasure in dispatching an animal that I have enjoyed watching scratch around the garden or raise chicks, but it’s part of the farm cycle, and one I accept living this life. So…the question becomes what to do with old unproductive chickens? Old chickens are fairly tough, as far as meat goes, eating them roasted or grilled is not a very appealing option, but aged and slow simmered with vegetables and aromatic spices and herbs makes the most wonderfully flavorful broth and base for soups, pot pies and casseroles. Once you have processed your bird, rinse thoroughly. Don’t trim the fat, it will help flavor the broth. Place the whole carcass in a large pot or container, deep enough so it can be covered with water. Herbs of your choice, like sage, thyme, marjoram, parsley and rosemary, plus a few bay leaves. Sprinkle in 1 teaspoon of salt and ½ teaspoon of whole peppercorns. Add an assortment of root veggies like onions, carrots, garlic cloves, and celery. These can be rough chopped into chunks. Now, cover the pot with the lid set a little ajar or loosely cover with parchment or wax paper (don’t use plastic wrap). Place in the fridge for a few days, but not more than a week. This is an important step in aging an old bird, as the process helps break down the muscle fibers and tenderize the meat. DON’T SKIP THIS STEP! It will make a much better end product. When the aging process is complete put the carcass, along with all the herbs and veggies, in a large stock pot and cover with water, adding more herbs and veggies if you like, then put the lid on. Set the pot to simmer and wait. This part can take 10 to 12 hours. Check periodically and keep the water level up. If you are using a slow cooker you can let it go all day and into the next day for really tender meat. Just monitor the water level. The bird is done when the meat is literally falling off the bone. Remove from the pot and set aside to cool. Once cooled, strip all the meat off the bones, reserving the skin, bones, veggies and herbs. You’ll see why in a moment. At this point you can shred the meat and return it to the pot to make a large batch of chicken soup or you can put the meat into freezer containers and cover with liquid for a later use. I like to freeze the base so I have the option of making soup, chicken pot pies or a chicken casserole at a later time. I don’t have a standard Chicken Soup recipe because it changes depending on what I have and what kind of chicken I’m using (I cook down every chicken carcass I bake). However, the basics are onions, carrots, celery, garlic, salt, pepper, savory herbs, a little Better Than Boullon and either noodles or rice. It makes a hearty cold weather feast after a day of chores. Back to our pile of bones. Toss the bones, skin and any drippings back into the pot and add water, more herbs and veggies to give it flavor, and simmer for 12 to 24 hours for the most fantastic broth you have ever tasted! You can also do this process in a crock pot if you don’t want to watch the stove. Once the bones have leached out all their nutrients you can strain the broth and either freeze it or can it. There you have it, a tough unproductive chicken turned into many flavorful meals for the long cold winter ahead. This is a lengthy multi-step process so make sure you give yourself plenty of time. I usually pick a cold rainy weekend. The warmth and smells fill the house. It’s amazing! The average American produces 5 pounds of trash…a day. I don’t think I produce 5 pounds in a week. I sat at the patio table organizing my stash of vegetable seeds, sorting by like kinds and those that were out of date. Without thinking I decided to sprinkle an old package of carrot seeds in my patio wash tub garden, not thinking what would happen if the seeds were still viable. When I say out of date I mean years, like 3, out of date. I suppose I thought not many of them would be good and only a few would sprout. Man was I wrong, dead wrong! It was kind of exciting to see a few green shoots emerge from the compost rich galvanized tub a week or so later. But, as time went on the sprouts multiplied and before I knew it the entire tub was covered with a feathery green carpet. I was not expecting a good portion of the seeds to sprout, that I can tell you. By now it was clear…I would have a bumper carrot crop, but in a potted garden instead of a raised bed. As time went on and the feathery tops grew it occurred to me that at harvest time I would have more carrots than a one person household could handle. I needed a plan and I needed one FAST! Fortunately, I love carrots, but honestly who needs that many fresh carrots…all at one time. I mulled it over in my head and did a bit of research, then went back and forth trying to decide what to do. It was exciting to find several very useful ways to preserve my orange harvest, ones that would fit nicely with the kinds of dishes I use carrots in. That was a relief, I can tell you. So here are five ways to preserve your carrot harvest, whether it’s small or large. How easy is that? My temperate climate lends itself well to just leaving carrots in the ground for quite a while. In colder climates, though, carrots can be covered with a thick layer of straw or leaves, about a foot deep, then covered with plastic, a tarp or even a small hoop house. If you live in an extremely cold area you can add an extra layer of mulch just to be safe. These thick layers will help insulate the carrots while the covering will help keep them from getting overly wet and rotting. When it’s time to use a few, simply move the mulch away from the tops and pull as many as you need, then push the mulch back into place. Easy, right? Root crops do especially well in root cellars. The trick to holding them for a long time is to leave them as natural as possible, meaning don’t was them. When they are harvested, gently brush off the excess dirt, trim the tops to about 2-inches and store them in a single layer in sand, straw or shavings. Make sure, though, that the shavings have not been treated with any anti-flammable substance. For best results and long storage the root cellar temperature should be consistently between 35-40 degrees and have plenty of humidity. Under the right conditions carrots should keep for about 4 to 6 months in a cellar. If you don’t have a cellar, like me, check out the link below for a simple root cellar perfect for the suburban homesteader. Or, you can cellar them in the fridge. Simply harvest, brush off excess soil and trim then store carrots in a zip lock bag or a shallow lidded container. They won’t keep as long in the fridge, but you should have fresh carrots for several months at least. With a little bit of prep work carrots freeze very well. Wash thoroughly before cutting off tops and peeling. Slice or dice into desired size or cut into sticks, then blanch them for 3-minutes in boiling water. Remove from boiling water and immediately plunge them into a bowl of ice water to stop the cooking process. Cool completely before placing carrots into plastic freezer containers or bags. Frozen carrots work great in soups, stews, pot pies or casseroles. 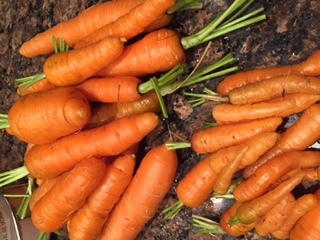 If you don’t mind a little bit more work, place carrots on a parchment lined cookie sheet in a single layer and freeze. This way they freeze individually and are easier to pull out a small amount if that’s all your recipe calls for. I freeze my carrots this way because it’s the easiest method if I don’t have a large batch of carrots all at once. 4.) Traditional canning works, too. Carrots are a low-acid vegetable and needs to be pressure canned if you choose this method. However, if you choose to make pickled carrots you can use the regular water bath method. Wash thoroughly, removing all dirt then trim tops and peel. Pack carrots into hot sterilized jars, and fill with boiling water leaving a 1-inch headspace. For my one person house I use primarily ½-pint and pint jars, but families may want to use larger jars. Carrots lend themselves very well to being dehydrated, to be used later in many crock pot or casserole dishes, even baked goods like muffins and cakes. To dehydrate carrots, wash, trim and peel as in the other suggestions, then blanch them for 3-minutes in boiling water and dry completely before placing them on the drier tray. Place in a single layer at 125 degrees and dry until they are almost brittle. There you have it, five ways to have the great taste of carrots in your winter dishes and baked goods. Check out this post to learn how to make a simple mini green house for your garden beds. Each day it seems like food prices go up. We are all trying to find ways to save a bit here and there on the foods we purchase. Food co-ops are a great way to lower food costs by taking advantage of bulk buying. But, what if there aren’t any food co-ops in your area, or what if you don’t need or can’t store a 50 pound bag of rice? Well, you could start your very own “micro co-op” with family and friends, and reap big savings. Gather a group of frugal minded people together who want to share in the purchasing of bulk items. Buy large quantities (like 25- or 50-pound bags) of staple items like flour, sugar, rice, and beans. Divide evenly among the group and share the cost equally…and, the cost savings. Be creative in thinking of other bulk items you could share and save on. With Labor Day just past many are turning their minds towards fall and winter preparations. It’s a time of transition for the garden; some crops are winding down while others are just coming on. Green beans are still going strong, their long green pods dangling on the vine with the promise of sweet crunchy goodness all winter long, if preserved properly. I love fresh green beans, blanched with a bit of oil and almonds or sauteed with bacon and onion. Nothing says fresh or summer like green beans. But how do you get that goodness during the cold winter months? I’ve never been a fan of canned green beans, either home canned or commercially canned. I get bored with the soft mushy texture when I’m longing for a bit of snap in my veggies. So I had to find a way to get what I wanted, and I think I have. One day, as I was setting blueberries out on parchment paper to freeze for winter storage, it came to me! What if I did the same thing with the green beans? So I gave it a try. First, I set a large pot of water on the stove to boil and a large bowl of ice water in the sink. While the water was heating up, I rinsed a batch of beans, trimmed the ends and set them in a wire colander. When the water came to a rolling boil I set the colander full of beans in the water to blanch for about a minute. You normally blanch beans longer, but I wanted to preserve as much of their crunch as possible. When the minute was up I pulled the colander out and immediately plunged the beans into the bowl of ice water to stop the cooking process. When the beans had cooled I dried them between two dish towels before arranging them in a single layer on a cookie sheet lined with parchment paper. You could also use wax paper, foil or any standard paper. The object here is to separate the beans from the metal so they don’t stick during the freezing process. Then I popped them into the freezer just like I do my berries. They will freezer individually instead of becoming anbig green bean ice block. When they had frozen completely I could now pack them into a freezer bag or in a tall lidded freezer container. The beauty of this method is that the individually frozen beans can be packed in small or large quantities depending on use or household size. For me, a loosely packed quart size freezer bag is just enough for this empty nester, with a bit left over for another meal. Now I can have the fresh crunchiness of green beans all winter long. I can cook them as a side dish or add them to soups or stews. I can even chop them up to add to a big green salad. But, my new favorite green bean dish is one I picked up from a little café in Texas—green beans with onion, bacon and a sprinkle of brown sugar. Try the recipe below…it’s easy, quick and I’m sure you’ll love it too! Thaw green beans completely if using frozen. If using fresh, blanch for 2 minutes in boiling water, remove from water and set aside. Cook bacon in a large skillet until almost crispy. Add onions and cook until onions are soft and bacon is crispy. Spoon out bacon grease, leaving about a tablespoon or so. Add green beans tossing to coat in bacon and onion. Sprinkle brown sugar and toss again. Remove green beans to a serving bowl and spoon the onions and bacon over the top.